I love attending conferences as much as the next guy. Large, cold auditoriums, hit-or-miss breakout sessions, forced networking, the hope that you’ll leave with a new idea or two to suggest to the team or impress the boss. You know the drill. However, this was not the regular drill. Last month, I attended Social Media Examiner’s Social Media Marketing World 2017 Conference. I left absolutely inspired and with ten pages of notes to equip me on my journey. I’d like to share five revelations that changed how I look at social media. Change is the most consistent feature of social media. Platforms are born and die, expand and consolidate, and algorithms change. The key lesson: don’t mourn the loss, just move on. Keep innovating, trying, testing and dreaming. Yes, Facebook changed its algorithm almost a year ago and sent marketers and publishers into a tail spin. Yes, Instagram added new features suspiciously similar to Snap (and while we’re on that subject, SnapChat is now Snap). And, yes, to Periscope or not to Periscope (or Facebook Live or YouTube Live or Instagram Live) that is the question. We’re pioneers in the relatively new frontier of social media. Hang on and have fun. Whether you are inundated with requests to post on social media or struggle to create enough content to fill the week, pause before you hit publish on your next post. Social media channels are oversaturated with content. Algorithms attempt to alleviate this by pushing well-performing (presumably valuable) content to the top and poor-performing (presumably irrelevant or undesirable) content to the bottom. To rise to the top, know your audience and craft content based on their interest, then weave your brand into what they are already consuming. Engagement-worthy content will offer information, assistance or amusement and provide immediate value or appeal. Content that isn’t immediately thumb-stopping will be passed. Highlight the details that matter most to your audience. Use visuals. Take the time to be creative, even if that results in fewer posts. If you use paid ads or boosted content, boost posts that are already performing well organically and sequence paid and organic content so it all looks organic. Experts suggest anything you do more than three times can probably be automated. Bots and artificial intelligence will change customer service. Rather than issuing an automated response to messages received on Facebook, bots could respond with a carefully-crafted, personally-tailored message through the use of machine learning to utilize keywords to create appropriate responses. In the healthcare industry, this could save substantial time responding to requests for an online diagnosis or second opinion; however, the potential for error risks compromising the user and the brand. Check out IBM Watson, Google Cloud, Amazon AWS, Facebook and Microsoft Cognitive. Video is largely underutilized. It receives 3x the engagement of other content but represents the lowest percentage of posted content. Square video performs better on Facebook and Instagram, earning a whopping 28% more views than landscape and takes up 78% more screen space than landscape. Videos should be designed to be watched with the sound on or off. 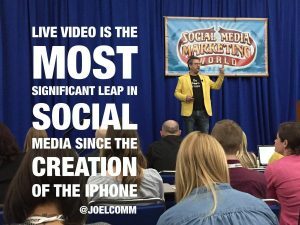 Live video can be a critical tool to showcase unique features of the company and connect viewers to your brand. However, it is important not to confuse informal, live video with unprofessional, live video. If you plan to use live video often, invest in professional software and equipment. Use speedtest.net to test your Internet speed before going live, ensure an upload connection of at least 10Mbps to stream. Before there were social media marketing managers, there were social media community managers. It is time to refocus on community development. Get to know the “locals.” Build relationships with people who regularly interact on your page and equip them to become brand advocates. Invest in many micro-influencers – real people, in real communities, with real influence who can reach many for your mission. By keeping “shareability” top of mind when crafting content, you are building a toolkit for your community to spread your brand in a personal and authentic way. Don’t miss your chance to learn from social media experts at the Mayo Clinic Social Media Network Annual Conference and Residency, December 11-13 in Scottsdale, Arizona. Learn more here.